Yesterday I took some time out from work and headed to Newcastle City Centre for cake, a cuppa and a catch up with my lovely friend Lisa. Its honestly been months since we've seen each other and a lot has happened since then (I won't go into that now) but this was most definitely way overdue. And what a wonderful day it was for us to meet. The sun was shining, the Continental Market was in full swing at Greys Monument, the city almost had a holiday feel about it. That meant I could pretend that I had escaped overseas, leaving everything behind even if it was for just a few hours. We headed straight for Cafe Royal as we wanted to enjoy the sunshine as much as possible and they have an outside seating area. Sunshine can be a rare thing up North, it was even snowing a few weeks ago so you need to take any opportunity you get. I've never actually eaten at Cafe Royal before although I've passed it many times thinking 'ooo that looks nice'. And you know what it was very nice indeed! 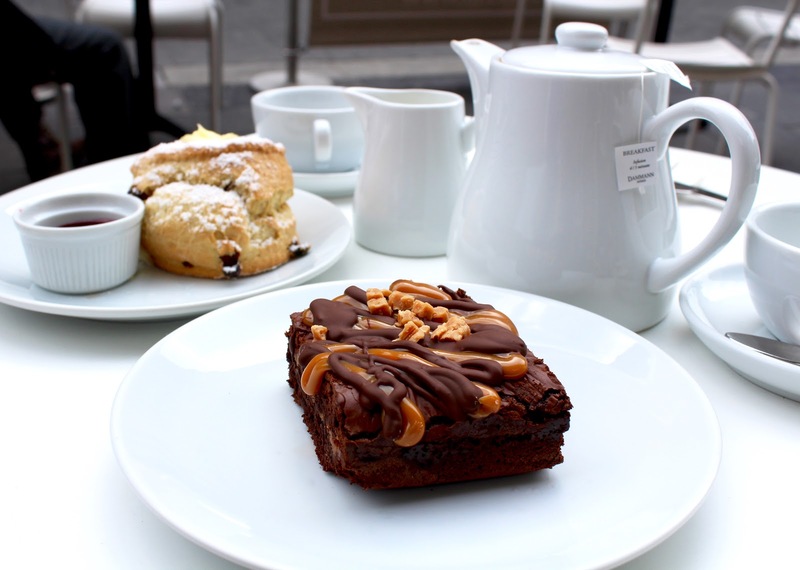 Alongside the obvious choice of tea (a must for a tea obsessive like me) I went for a Chocolate Caramel Brownie (OMG you need to try this!) and Lisa had the more traditional Fruit Scone with cream and jam. Both were splendid examples of cakey loveliness and quite frankly I almost struggled to finish mine. I even had to have an interval in the middle to help me get through it. After a good couple of hours catching up on life, love and work I headed home and hit the studio for the rest of the evening. When you work from home it can be really easy to get lost in your job and forget about breaks. That means time off with friends and family is essential, you need to get out and about otherwise you'll start to lose the plot. Yesterday was lovely and today I'm left feeling recharged and have had a most productive because of it. I'm definitely going back it was so nice.